On the 5 & 2 & 2 Plan, you'll eat six times each day. Yes, we said six and it's not because we're terrible at math! While 5 & 2 & 2 do, indeed, add up to nine, we're asking you to mix and match the components of our program and eat six times a day. This will require some fun combinations and ensure that you're getting all the nutrition you need as you work toward your weight-loss and weight-management goals. Now check out the three components below 5 Medifast Meals, 2 lean & green meals (with healthy fats), and 2 healthy snacks. Each day, you'll choose a variety of five of our delicious, nutritious meal replacements. Each day, you'll choose two meals of your own, each with a serving of lean protein, three servings of non-starchy vegetables, and up to two servings of healthy fat (depending on which lean protein you select). Each day, you'll choose two snacks to eat with your other meals (not on their own). Make sure you choose a variety. 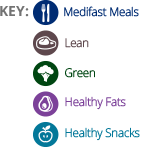 Planning what you'll eat each day and when is an important key to success with the Medifast 5 & 2 & 2 Plan. Below are two sample meal plans to give you an idea of how the plan can work for you. We recommend eating every two to three hours. Meal plans can be modified according to your own food preferences and schedule. Enjoy your lean & green meals any time of day breakfast, lunch, dinner, or in between whatever works best with your schedule. Divide the meal in half and eat it as two portions, if you wish, but be sure to eat only the specified amounts of protein and vegetables each day. And be sure to get in all five Medifast Meals! Copyright © 2015 Medifast, Inc. All Right Reserved. 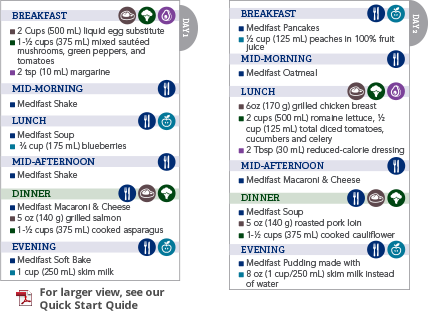 Medifast makes no claim about your weight loss potential under the Medifast Meal Plan. Medifast recommends you consult with a physician before starting a weight-loss program. Individual results will vary. The MedifastTM 5-2-2 PlanTM is designed for overweight and obese adults ages 18-65. We recommend you discuss any medical conditions, medications (including vitamin and/or mineral supplements), and weight-loss plans with your health care provider before staring the Medifast Program. Please do not use the Medifast Program if you are pregnant or breastfeeding/nursing. If you currently have or have had cardiovascular disease, bariatric surgery, hypertension, cancer, diabetes, liver disease, or a condition that requires you to follow a modified diet plan, consult your health care provider before use. Do not use if you currently have an eating disorder (e.g. anorexia, bulimia), gout, or kidney disease or have been medically advised to follow a low-protein diet. If you are taking diabetes, thyroid or blood thinner medication (e.g. Coumadin), consult with your health care provider before use.